Get high-performance, silicone and solvent-free spatter control. The clean rinsing formula protects welding equipment and work surfaces, eliminating the need for grinding, scraping or other spatter removal methods that can cause damage and injury. The easy-to-use formula goes on quickly and is non-flammable, non-corrosive, non-hazardous and readily biodegradable. It contains no added color or scent, making it ideal for regular use. 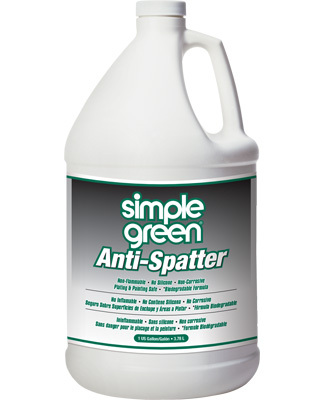 Simple Green Anti-Spatter is a solvent-free spatter release solution, formulated specifically for the welding industry. The formula is safe for use on aluminum and steel nozzles, diffusers, tips and other surfaces adjacent to welding.